Compulsive collecting or Hoarding is a misunderstood and debilitating mental health issue. Many psychologists and counsellors never see someone with this condition as they very rarely present for help. This article from an Australian newspaper provides an excellent overview of the condition and issues underlying hoarding, and I have included links to two brilliant books co-authored by the researchers discussed in the article, who have developed a wholistic and novel approach to it’s treatment. They may dress well or hold down a good job. But hoarders are unhappy people who suffer from a debilitating condition. Every suburb has one. The elderly woman weaving through an overgrown backyard full of cardboard boxes, old tyres and discarded furniture. Cats perch on every surface; kittens roll about among the rusted drums and long grass. Inside, behind closed curtains, the rooms are piled high with papers, cups, plates and bottles. Broken toys, old clothes and shopping bags spill across kitchen benches and floor, smothering the stove and filling the sink, neither of which has been used in years. The stench of cat faeces, urine and food scraps fill the house. To her neighbours, she is an oddity. Or a pest, bringing down house values and encouraging vermin. But to therapists she is one of a growing band across Australia suffering from a debilitating condition known as compulsive hoarding, where people feel a need to collect and store items that seem useless to others. Their homes become havens of insurmountable clutter and junk, often leaving them unable to sleep in their beds or use appliances. Many end up with electricity or gas supplies disconnected or their fridge and washing machines unusable because they fear their lifestyle will be revealed if they contact a tradesmen to make repairs. This secrecy and shame make it difficult to know exactly how many people have the disorder. Some experts think between 200,000 and 500,000 Australians compulsively hoard, but others put the figure closer to 800,000. Louise Newman, the president of the Royal Australian and New Zealand College of Psychiatrists, agrees. There is little research on the condition in Australia and not much in the way of funding or treatment programs, but experts are hopeful hoarding will be included in the next (fifth) edition of the Diagnostic and Statistical Manual of Mental Disorders, the bible used by mental health experts to diagnose psychiatric conditions. Many sufferers fall between the cracks because hoarding is not a clinical diagnosis in its own right, but is seen more as an offshoot of obsessive compulsive disorder, muddled with depression, anxiety, panic disorder and low self-esteem. “But it is different to OCD and once we get it in the DSM-V, therapists, psychiatrists, psychologists and social workers can then be trained in the management of it [and] we can attract funding for research,” Mogan says. Jessica Grisham, a clinical psychologist who specialises in obsessive compulsive disorder, also believes compulsive hoarding should be included in the next edition as it requires specialised treatment. She cites recent neural imaging studies in the US that showed that different parts of the brain were activated in hoarders than in obsessive compulsive disorder patients. Mogan and Grisham agree that cognitive behaviour therapy, where sufferers are slowly taught to change their thought patterns, is more effective than medication alone. But hoarders responded better to a specially adapted version of the therapy, developed by the American hoarding experts Gail Steketee and Randy Frost. It had been achieving success with about 60 per cent of hoarders – far more than standard cognitive behaviour therapy. “But it has to be a long-term project. You don’t go in to someone’s place and do a sudden excavation against their will,” Grisham says. Mogan agrees. A pay TV show, Hoarders, was damaging to the public’s understanding of the illness, because it focused on forcefully cleaning houses in three days. Mogan makes weekly home visits to hoarders, and focuses on getting them to reduce the associated dangers by ensuring their home has two exits for safety, and working appliances and smoke alarms. Sometimes the problem extends beyond mounds of paperwork and clothes. Mogan and Grisham know patients who hoarded urine or fingernail clippings. Some stored their own faeces or collected one particular item, such as bicycles. One sufferer was hoarding so much junk, the only access to the house was a 30-centimetre gap at the top of the front door. But for Allie Jalbert, of the RSPCA, the most distressing hoarders are those who keep scores of cats and dogs, all battling for attention and food on a crowded suburban block. She has been calling for years to have hoarding classified as an illness in its own right to allow more people to receive treatment and put an end to the 100 per cent recidivism rate. “Often, we find that hoarders might be treated for peripheral symptoms such as anxiety or depression, but their core problem, the hoarding, is not addressed. So once we have cleaned out the house, they reoffend, which is very, very frustrating for everyone involved,” Jalbert says. Some people threatened suicide and had to be removed by police when faced with the prospect of giving up their animals or clutter. “There’s a mixed bag of emotion when you deal with hoarders. Firstly, there is the concern for your personal safety but there is also a degree of empathy because often these people are quite emotional and attached to the animals. But it’s quite frustrating to see animals living in such horrific situations,” she says. Who develops the condition and why? 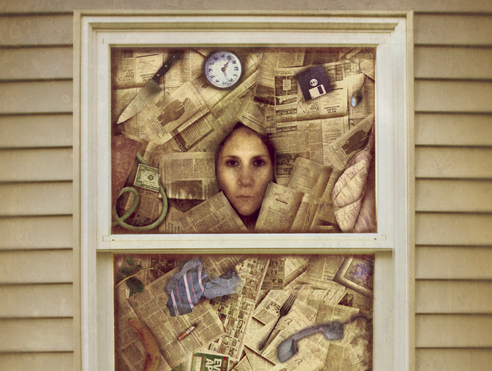 Some studies have shown that many hoarders have been brought up in households where chaos reigned. Some were neglected as children and witnessed pets being treated poorly. Mogan accepts the aetiology is mostly unknown, but cites an Australian study that found sufferers reported failing to connect with their parents or growing up in households lacking emotional warmth. The condition affects slightly more women than men but is found across all occupations, age groups and ethnicities. “And they are in relationships,” Mogan says. “Albeit strained ones. Mogan runs group therapy sessions in Melbourne and says that many patients do want to be cured. This is a very succint article and the books referred to are excellent.There is also a new one out written by the same experts Stuff: Compulsive hoarding and the meaning of things. I work with hoarders in the UK and am attempting to help the authorities understand the condition. At present there is no strategy for help in the UK at all! I really like the artwork at the top of the article – does anyone know whose it is?